Bringing back Glass-Steagall: Will Trump break up the big banks? Will Trump break up the big banks? Wall Street stalwart JPMorgan Chase CEO Jamie Dimon is heading to Washington on Friday to meet with President Trump. It will be Dimon's first meeting with Trump as part of the president's CEO advisory group. The summit is likely to feature lots of talk about slashing burdensome regulation, including on banks. Trump just this week pledged to "do a big number" on the Wall Street reform law known as Dodd-Frank. But will Trump also bring up his pre-election pledge to bring back Glass-Steagall? Returning that Great Depression-era law would force the mega banks to break themselves apart by separating their Wall Street investment bank divisions from their Main Street checking account business. On the one hand, a revival of Glass-Steagall would fly in the face of Trump's push to accelerate the American economy by massively reducing regulation. Renewed talk of bringing back Glass-Steagall, which was repealed in 1999 under President Clinton, would surely upset the markets as well as pragmatists in the Trump administration like former Goldman Sachs executives Gary Cohn and Steven Mnuchin. 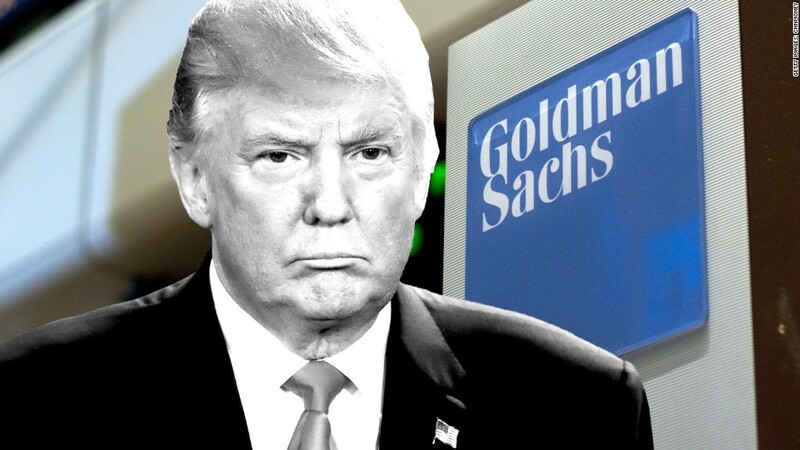 But Trump did bash big banks before the election, especially Goldman Sachs. Breaking up the banks would appeal to Trump's populist message of draining the swamp by uprooting the establishment. The new president could also argue it solves the Too Big To Fail problem that the 2008 financial crisis exposed. Plus, it's something that Republicans like John McCain and liberals such as Elizabeth Warren and Bernie Sanders broadly agree on. Glass-Steagall was even included in the official Republican Party platform during Trump's convention. It would also please Steve Bannon, Trump's powerful chief strategist who Time suggested this week may be the "second most powerful man in the world." Bannon (another former Goldman banker) told BuzzFeed in 2014 that he believes "you really need to go back and make banks do what they do: Commercial banks lend money, and investment banks invest in entrepreneurs and to get away from this trading." That sounds a lot like Glass-Steagall. It's not totally clear where Trump stands on this right now. Sean Spicer, the White House press secretary, was asked on Wednesday if Trump still supports reestablishing Glass-Steagall. "The president's position is consistent, yes," Spicer said. But Spicer also suggested the question is a better one for Mnuchin, Trump's treasury secretary nominee whose confirmation is being held up by Senate Democrats due to concerns about his business and financial ties. During his confirmation hearing, Mnuchin said he's not in favor of going back to Glass-Steagall as it was written in the 1930s. He warned that separating retail banks and investment banks could hurt access to credit and upset markets by limiting liquidity. Mnuchin did say he's in favor of a "21st Century Glass-Steagall" -- but he didn't explain precisely what that is. Senator Maria Cantwell, a Democrat from Washington State, cosponsored legislation with Warren and McCain called the "21st Century Glass-Steagall Act" that expands on the original law by also separating derivatives trading and other shadow banking activities. Asked if Trump supports this legislation, Mnuchin said in a follow-up written response that the administration believes new legislation "should reflect the reality of today's financial institutions and markets." Related: Icahn declares end to 'socialism' in U.S. In any case, there doesn't seem to be enough appetite in Congress for bringing back Glass-Steagall. Glass-Steagall doesn't have a "ghost of a chance of returning in 2017," Nathan Dean, a financial policy analyst at Bloomberg Intelligence, wrote in a report this week. More likely, Congress will take up a form of the Financial Choice Act, a Republican bill that offers a mix of carrots and sticks. On the one hand, the bill would encourage big banks to raise more capital -- arguably more than they would want to raise -- so that they can avoid enhanced regulation. But the Financial Choice Act would also gut key elements of Dodd-Frank, including the Volcker Rule that bans banks from making risky bets with their own money. It would also repeal the Consumer Financial Protection Bureau, the watchdog agency inspired by Warren. "The most likely development is that we get less, not more regulation," said Robert Shapiro, a former Obama adviser and senior fellow at Georgetown University's McDonough School of Business.